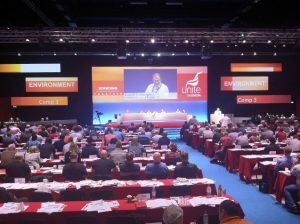 Unite’s fifth policy conference will take place in 2018, and we want to make free movement a big topic of debate. If you’re a Unite member, get your local branch to submit our model motion below. This conference notes the debate on immigration currently underway in the context of the Brexit negotiations, with the Tories committed to ending free movement. Stagnating wages, crumbling services and the housing crisis were caused by government and employers making the rich richer at working people’s expense – not immigration. Dividing workers along national lines is the oldest trick in the book. We need real solutions to the problems facing working people: massive public funding to ensure good jobs, homes, services and benefits for all; scrapping of anti-union laws and stronger rights so workers can push up wages and conditions; and communities uniting across divisions to win changes. The labour movement is a movement for all workers, regardless of where they were born. We note many struggles where migrants have been central to improving low-paid workers’ wages and rights. Our movement must not give an inch to the falsehoods used to turn domestic against migrant workers. Free movement benefits all workers. Without it, only the rich and privileged can live and travel where they want. Free movement ensures that migrants have rights. Ending it makes migrant workers more vulnerable to hyper-exploitation, making downward pressure on wages more likely. Workers are much less likely to organise in a trade union if the penalty for standing up to your boss is being deported. Britain and the EU should welcome migration across Europe and from beyond. Limiting free movement further would damage the economy and hit living standards. This conference resolves to campaign to defend and extend free movement; scrap the net migration target; strengthen refugee rights; dismantle the brutal anti-migrant regime built over decades; abolish immigration detention centres; ensure the right to family reunion; end use of “no recourse to public funds”; end use of landlords and health workers as border guards; and reverse attacks on migrants’ access to the NHS. Unite will work with like-minded forces across the movement to ensure that this becomes Labour Party policy.